“Our involvement in Iraq, for want of a better word, radicalised a whole generation of young people, some of them British citizens who saw our involvement in Iraq, on top of our involvement in Afghanistan, as being an attack on Islam, not a whole generation, a few among a generation”. Who said this? Jeremy Corbyn? 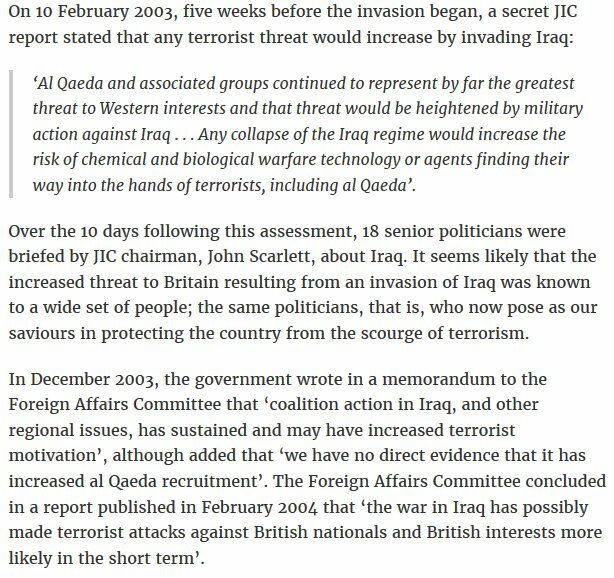 No, it was Baroness Manningham-Buller, head of the domestic intelligence service between 2002 and 2007, speaking to the Iraq Inquiry. Read Jeremy Corbyn’s full speech here. When Theresa May called the election Tories had a 24 point lead. Today it’s just 5. A combination of over-confidence, belief in a pliant dullard media and the hubris conceived of being locked in the chocolate box of Westminster with braying Tory MPs laughing at Jeremy Corbyn has resulted in this collapse. While this campaign will be seen as a humiliating defeat for May and her advisors, it’s the fellow-travellers within the Labour Party who have knifed their leader at every opportunity that we should really be laughing at. We can now expect the smear campaign to go in to hyper-drive. The essence will be ‘Get Jeremy”. But what Corbyn is saying, is not just commonplace commonsense, it’s been said over and over again by the British establishment. Whether opposition parties can speak truth to power and state plainly what security chiefs and the JIC have already said publicly without getting crucified in the media remains to be seen. If Corbyn’s Labour survives or even triumphs it will be from a combination of the Tories alienating their core pensioner vote, a late surge in youth voter registration, a personally disastrous campaign for the Prime Minister and a Labour manifesto that defied ridicule to embrace popular left policies. North of the border any success is less likely to be visible. Yesterday, inexplicably, the Scottish Labour Party decided to ditch its opposition to Trident renewal. A Labour spokesman said that this was “due to the devolved nature of defence”. Morality devolved is morality retained it seems. The inability of Jeremy Corbyn and his advisors to see the opportunity for cross-party working and their continued inability to grapple with ‘the national question’ is a fatal flaw. But on June 9th it may be Corybn that is still leader and Kezia Dugdale that is not. Either way, a minority Labour government requiring SNP and Green support, or a Labour Party that could have won were it not for another Scottish collapse will raise questions that are impossible to ignore. It’s impossible for Corbyn’s Labour to hold their position on self-determination around the world but not for Scotland, just as it’s impossible for them to hold the position that Britain’s disastrous foreign policy misadventures have led to chaos and instability, but that Trident is a force for peace and stability. I disagree that we should be laughing at those who were trying to smear Corbyn (as a Corbyn supporter). There main argument was that they thought he was unelectable, not that they necessarily disagreed with his views. Humility in victory (or close defeat!) will be key within the Labour party to heal itself. The SNP may have won over left-leaning former Labour supporters for the near future in Scotland, but if Labour’s divisions are “healed” after this election, whatever the final result, then there will be serious left-wing representation UK-wide, which is something I certainly want, and the Labour party should be striving for. The days when the British state could inflict violence on others with impunity are long gone. The only problem is that the Tory mindset that thought this was an acceptible way to conduct foreign policy is still with us and that includes those Tories in the Labour party. We live in an interconnected world where action and reaction may not be equal but are guaranteed. Time for the Tories to grow up and accept the consequences of their actions. Robin Cook may have been right about an ethical foreign policy but unfortunately he was up against an embedded imperial mindset which was never going to agree. Brexit will at last force the establishment to realise that they really are no longer a world power and should they continue to have those ambitions,to quote a phrase often levelled at us separatists by the Westminsterites,”where are they going to get the money from” ? I think that a lot of voters are becoming increasingly turned off by Theresa May and her gang. 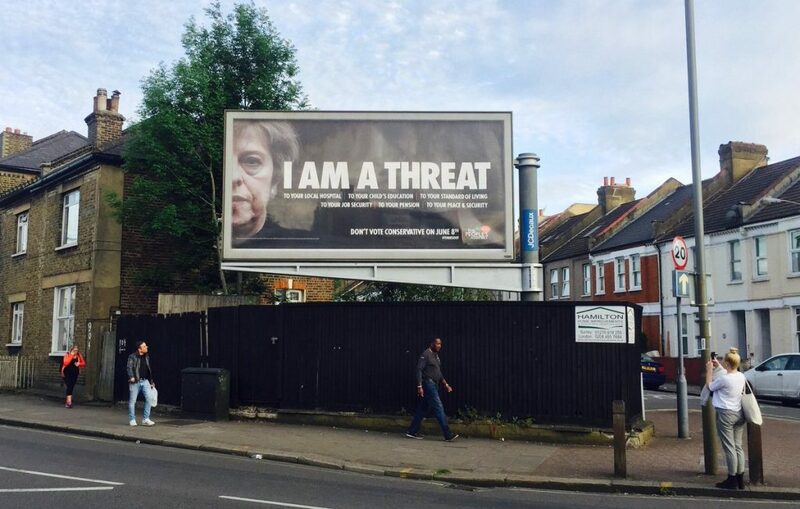 I have some hope that British democracy can see her out of power. Still less than 50 / 50 though. It doesn’t look like Labour in Scotland will ever come to their senses. Even if Kezia goes the likely new branch manager will just carry on the same failed approach of denying democracy for Scotland. Weird. A supportive post that suggests Theresa May has made a mistake and may not win the GE, as generally touted as inevitable, doesn’t appear here? For the record, I think the Tories are losing this, so we can expect dirty tricks of the first order. 26 Christians shot dead in Egypt today. Somehow I think Islamism is going to be an ongoing problem for the world in the first half of the 21st Century. And Egypt is the birthplace of Islamism, that fusion of theocracy and European totalitarianism created by al-Banna and Qutb. the Tories may have wobbled. But the Manchester bombing will mark their recovery and ensure them a big GE win. I predict the wipeout of many traditional Labour held seat in the north of England. The British Establishment can’t afford to lose Scotlands assets, on top of the Brexit disaster. A Labour minority government, propped up by the SNP, will put to bed an Indy ref for a while. Folk need to remember that there is only one Westminster Party when the Establishment is threatened. passages from a holy book, when taken literally is the real reason ??? according to these creatures. such a vile,poisonous person have a platform to spout such hatred. Even as pages in newspapers are devoted to the bombing in Manchester, if you read the foreign news,tucked away on one page, are reports nearly every day of civilians in Iraq ,Afghanistan and Syria being killed by Western bombs. Just a few lines but with a little imagination you realise that the relatives of these people are just as devastated and angry and defiant as we are in Britain when our civilians are killed and wounded. Surely nobody can imagine that is not a factor in terrorism. I have heard people arguing that it’s not that,it’s something else, but it can be no coincidence that these attacks seemed to become much more common after we got involved with America in bombing Iraq. When you remember how badly we then treated people who helped us and whose lives and those of their families were then put at risk, the people we accidentally killed ,the state we left countries in etc etc ,we shouldn’t be surprised that in the chaos we left, terrorist organisations with opposite views to ours should start to form. It can only get worse if we don’t stop getting involved with Donald Trump’s Increasingly bizzare interventions and sabre rattling and cosying up to Saudi Arabia to sell them more weapons- the Tories are very dangerous in this regard and we’ll be talking to a lot more questionable regimes about “shared values” when we don’t have any friends left in Europe.